Simulation of digital ad on bus. Message could change every 3 seconds. Public buses turned into rolling advertisements for movies, TV shows, and other products and services are a common sight on Los Angeles streets, but the sides of some those buses may soon be displaying those ads on electronic signs as large as 30 sq. ft. and changing their brightly-lighted messages as often as every three seconds. State law now limits electronic displays on the outsides of buses to route numbers and related transit information, but a bill passed yesterday by the California State Assembly would allow commercial advertising on electronic signs. The signs could display static ads that change no more frequently than every 3.2 seconds, and “streaming” ads that move across the signs with a duration of between 2.7 and 10 seconds. One of the electronic signs would be allowed on each side of the bus, with none on the front or back, and ads would have to remain static when the bus was operating on a freeway. 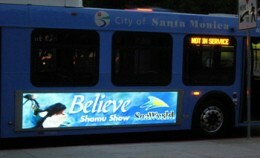 The bill, which passed on a 63-1 vote and now moves to the State Senate, establishes a 5-year pilot program for the Santa Monica public transit system, which is called “Big Blue Bus.” At the end of the five years, transit officials would be required to report on any adverse effects on traffic or pedestrian safety. She did not point to any proof that digital ads are “road-safe” although she might have been alluding to several studies sponsored by the Outdoor Advertising Association of America purporting to show that digital billboards do not increase traffic accidents. The methodology of those studies has been criticized by independent experts. The Big Blue Bus routes aren’t limited to Santa Monica, but reach into other areas of L.A., including Westwood, Culver City, and downtown. The city of Santa Monica has a no-exceptions ban on off-site advertising, and only a handful of conventional billboards that pre-date the ban can still be seen on the city streets. The city doesn’t allow any commercial advertising on digital signs on private property.